I spend a lot of time in the kitchen when I'm preparing a recipe for Cooking For Engineers. Sometimes, after a while, my feet, knees, hip, or lower back can start to hurt. I don't like wearing shoes inside the house, so my feet really aren't getting the support that they are supposed to have especially if I'm on them for a few hours. Enter the GelPro Mat - a soft but supportive floor mat that absorbs shock and spreads out the weight across the whole foot. I've been using the Mat in my kitchen for the last six months, and I can definitely say that it works! According to the GelPro website, pain, discomfort, and fatigue comes about due to the tightening and constricting of muscles from standing on hard surfaces for a long time. The constriction reduces blood flow causing aches and leads to muscle spasms and pain. The constriction can also affect nerves which can cause fatigue and lower-back pain (as well as pain in other parts of the lower body). All I know is that when I stand for a long time on my laminate wood floor in my kitchen, the heels of my feet start to hurt (from the pressure of the hard surface) and some of my muscles start to ache. When I stand on the GelPro Mat, I can feel that the pressure is spread out and there are no "hot spots" on the bottom of my feet where there is more pressure. Also, when I step around on the mat while I work, the impact of my foot coming down on the ground is absorbed remarkably well without the floor mat feeling squishy or weird. The density of the gel is just right to absorb the force without feeling like I'm stepping into some soft or gooey. Since most of my time is spent photographing the preparation of recipes, I usually keep a 20-in. by 36-in. mat in front of my prep area. The mats also come in a 20-in. by 72-in. version as well as a plethora of colors and textures. The mat I have shown in these photos is a basketweave GelPro Mat in chestnut color. It cleans really easily, usually I just wipe it off with a paper towel and if there's something on sticky on there a damp paper towel takes care of it. So far I've needed to use a little dishwashing detergent (the hand use kind, not the machine kind) just once. I wiped it on with the damp paper towel, rubbed off the greasy spot, and wiped it dry - the mat returned to it's original look. I don't know what else I can say about these mats. After six months, I know they work - my feet, legs, and back don't feel fatigued while I'm working in the kitchen, it's comfortable to stand over long periods of time, and I can't imagine working in a kitchen without one now. I highly recommend getting one or two of these mats (one in front of the stove and one in front of where you prepare you ingredients) for your kitchen especially if your kitchen flooring is hard (which it probably is - I can't imagine a carpeted kitchen). The easiest way to get them is to order them direct from the company by going to GelPro Pad's Product Page. At the time of the writing of this article, the basic 3-ft. wide mats are $99 and the 6-ft. wide mats are $199. It makes a wonderful gift for yourself or for the one who cooks in your household (or the one who does laundry). I used to have this problem until I started wearing Crocs around the house, especially while cooking. 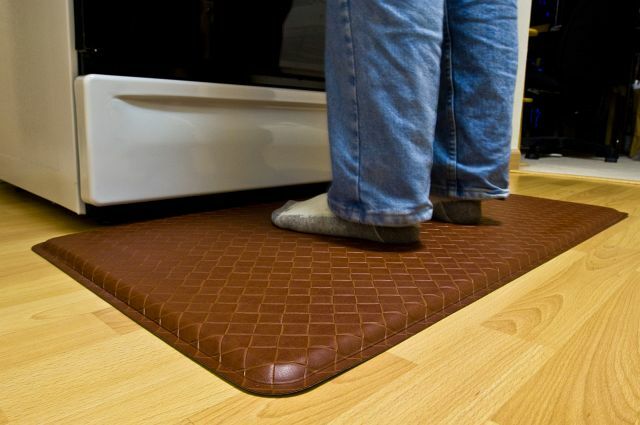 They're ugly, but they're very comfortable and a lot cheaper than these mats-- plus they work everywhere in the kitchen (and house), not just a small work area. My father works in a factory and stands on concrete floors all day. It's amazing how hard a concrete floor is on your body. He's just got a small piece of plywood and he says you wouldn't believe how much better even the plywood is over the concrete floor. When I'm at work standing for a while, I'll even throw down a flattened cardboard box, and it works great. Even though those are MacGyver solutions and horribly ugly, I can appreciate what a mat like that would do...and you say you've used it for 6 months, so it seems pretty reliable...seems worth it! Hey, just so you know, the link to the gelpro site is missing a colon. If I'm spending large amounts of time in my kitchen (Christmas cookies, Thanksgiving pies, what have you), my solution is usually to borrow (i.e. take without asking) my husband's temperpedic slippers. But I totally understand the no shoes inside thing; after a while, my feet seem to get too warm. This mat thing is an idea that would be so much easier to consider if the price tag wasn't so frightening, but I still might think about it. 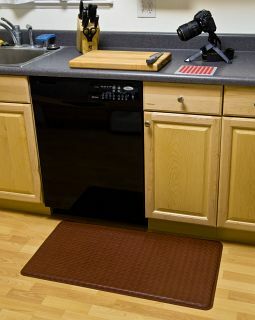 My kitchen is small enough I could get one mat that covers both the area in front of my stove and my prep area! Thanks! I fixed the links. I've had this mat for about two years. It is comfortable but I have a complaint that the edges curl up after some time, maybe a year. The mats are now sold at Bed, Bath, and Beyond. The full price is the same but you can probably use one of those coupons for 20% off. The 20% off coupon at Bed Bath and Beyond is a great tip. I'll let you all know if and when my edges begin to curl. Your feet were perfected over millions of years of evolution to do just that. Stand on them. Shoes harm your feet, they don't help them. Your feet were perfected over millions of years, but during the last several centuries we invented hard flooring which evolution hasn't adapted for yet. Good shoes do not harm your feet and actually protect them from the damage of standing, walking, and running on hard surfaces. Hmm. That does look like it would be quite comfortable to work with. My only problem is, with my weight (260 pounds), I would be afraid of creating too much wear on it. Does yours seem to be a little worn where you normally stand, or is it still as good as new? It seems to look and feel like new. I weigh 150-155 lbs..
Bought several of these mats for my husband's shop tool stations. He probably weighs between 240-260, and standing on a concrete floor for hours messes up what is supposed to be enjoyable time. The mats really help. I don't need them in the kitchen myself. Shoes are necessary for me to be in a frame of mind to work. I don't take mine off until I get to sit down for a longish break. That's just me though. I would caution against working in the kitchen barefoot or in socks without proper footwear. Drop a knife once and you could change your whole future! I am teaching my son the ins and outs of food prep, safety with the tools, and sanitary practices. I wouldn't be without shoes while he is assisting. We bought a GelPro mat a little over a year ago. Oh boy, it was great when we first got it. However, eventually the edges start to curl up, and now ours is full of little holes and slits. There are only 2 in our household. I cannot stand on it in bare feet or I get little cuts. Somehow I think if you buy an "industrial" mat for a hundred bucks -- and you do not happen to be a "commercial" kitchen -- the darned thing should last almost forever. I'm pretty disgusted and disappointed! It began to curl up on the edges during the year's warranty (but this was not considered to be any kind of defect) -- and I'd say the HOLES appeared about 6 months after the warranty was up. Have talked to the company, and they are not too helpful -- at least not when we called them. We were sort of surprised to find that they had little concern about the mats past the first year. I'd think, given the price, they'd be a little more interested! I had a mat for about a year and the edge started to curl. I called GelPro and they were great about it. They replaced my mat for free. They indicated that some of the older mats would do that, but the newer ones shouldn't have the problem. However, they said that if they did, they'd replace them for free. I love my gelled mat. I could stand on it for hours. I bought one of the large mats and thought it was great. I immediately bought 3 more for my mother, s-i-l, and friend. And, about 5 months later, in four different households the ends started to curl up, then the edge all around the mat turned up - they became dangerous trip possibilities. Once a week I would flip mine over and let it sit upside down for a while, but that only helped some. My s-i-l's almost completely dissolved. I called Gel-Pro and they said I was past the year warranty (by about a month) and that they would give me 10% off on a new mat. So, I flip mine over and over and use it up side down sometimes, my s-i-l's has been trashed, and my mother's is taped to the floor. Get a pair of birkinstocks to wear inside the house, including your kitchen. I had back and hip problems, and a heel spur, and finally bought a pair as an experiment. They are too ugly to wear outside of the house, but they are super comfortable. I believe they cured the heel spur completely, after wearing them for awhile. They give incredible support to your back, legs, and hips because of how they support your feet and body. They look uncomfortable, but actually become very comfortable. THey are also cool, as they are open sandals. They are better than going barefoot. Going barefoot is actually not the best for your back and feet. You start having bad posture, which in turn affects your back posture, getting it out of alignment and causing huge problems. Birkinstocks keep your spine more in alignment. They also give your feet exercise as you walk around in them, because of their construction and how you grip with your toes to walk in them. I have one ugly pair that I have had for several years now. They don't wear out, and as I said I only wear them inside the house. Currently, Costco warehouse stores (in SLC, UT, at least) have GelPro Cordoba mats in truffle and sable for $70. As an added note, I believe the mats sold at Costco are a little smaller in dimension than the one I reviewed. We've had our mats since Christmas 2009. That's all we requested from our kids. We've got a 24"x36" one in front of the stove and a 24"x72" that extends from where the other one leaves off under the counter to the wall (in front of the sink), resulting in an L-shape. I am very overweight, and though I wear shoes when I cook, the mats are necessary to provide relief from pain after long cooking-and-cleaning episodes. We've not had any cutting or curling; they clean easily; but without a textile rug in front of the sink (over the mat), water drops land and track through the kitchen. However, at this time, we [u:41387ff921]love[/u:41387ff921] our mats. Working in professional kitchens I have come to love Crocs for inexpensive foot support and protection in the kitchen. I have a pair at home for use specifically in the kitchen - these are not "outside shoes", but considered more like slippers and live in the kitchen. For $40CDN these have been simply perfect in every way. There is a model designed for chefs, with closed toes, sides, and heels that I use and highly recommend. If you have more money to spare, I also hear great things of Birkenstocks from co-chefs. If you have even more money, or simply must cook in socks or barefoot, then these gel pads sound good. Personally I feel they make a kitchen more dangerous due to changing floor surfaces increasing the potential for a slip when you step a socked foot onto a slippery floor.